When I think of Gratitude, I think of November. I like to do things to show gratitude all year long, but in November it is especially on my mind as we celebrate Thanksgiving and spend time with family and friends. This post contains Amazon Affiliate links for your convenience. As part of our Weekly Virtual Book Club we will be focusing on Gratitude all next week and we will be reading Bear Says Thanks by Karma Wilson. We love to take thank you cards and treats around to friends. We also love to create a visual way to keep track of some of our thankful activities during the month of November. 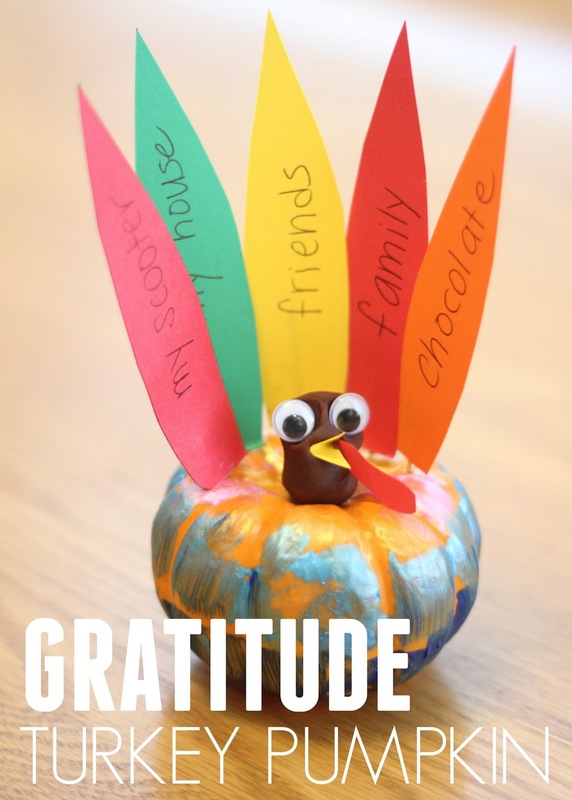 By creating simple gratitude turkey pumpkins, we can be reminded of all of the things we are grateful for. We can also making gratitude turkey pumpkins for friends to let them know how much we love them! Start off by painting your pumpkin! We used a simple foam paintbrush to decorate the pumpkins. Next we brainstormed all of the things we are grateful for and then each kid wrote what they were thankful for on paper leaves. Next we attached each leaf to a toothpick (with tape) and stuck it inside the pumpkin. The toothpicks break easily if you push them too hard into the pumpkin, so that was a grown up job! Pushing the toothpicks into the pumpkin makes them secure. After the turkey pumpkin was all decorated we stuck a big piece of brown playdough over the pumpkin stem and then we added googly eyes, a paper beak, and a paper gobbler using our cardstock scraps. The kids thought it was so funny to make a turkey head out of playdough. Once the gratitude turkey pumpkins are done they can be saved to use as decor for Thanksgiving or kept out as a happy reminder all month long. I loved hearing the silly and sweet things my kids were grateful for as we chatted and made our pumpkins. I love leaving them out to display and use all month long. You can see our painted name pumpkins here that are also fun to make. 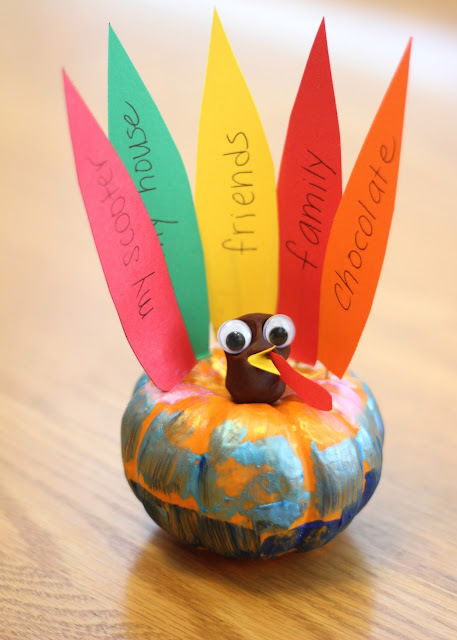 To make a Gratitude Turkey Pumpkin as a gift, instead of writing things you are thankful for in your life, pick a person and write down all of the things that you are grateful that they do. 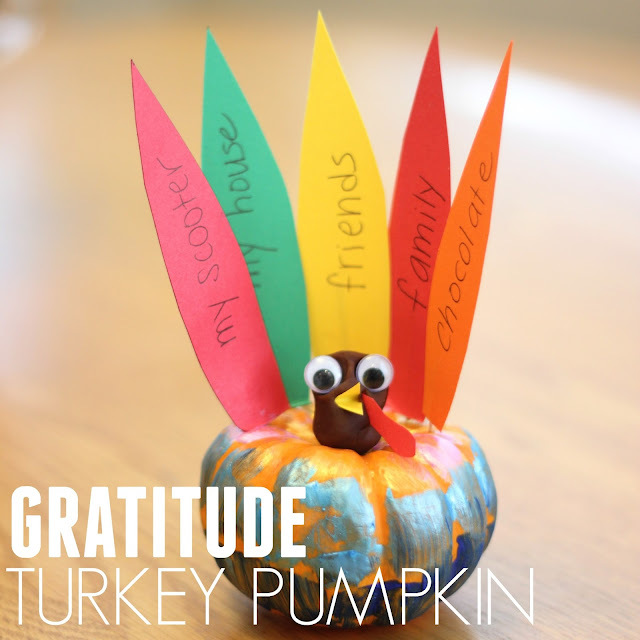 Stick on the thankful feathers and make the turkey face and drop the gratitude turkey pumpkin off to your friend! If you haven't made a turkey out of one of your pumpkins yet, you've got to try it! It is so funny and my kids thought it was such a goofy thing to use to make a turkey. Do you have any favorite gratitude books? How about any favorite gratitude activities? Tell us about them in the comments!